Much how Netflix has transformed the way we watch television, telemedicine aims to change the future of consumer healthcare. As the demand for convenient and flexible healthcare increases among consumers, virtual doctor visits are becoming more and more common. 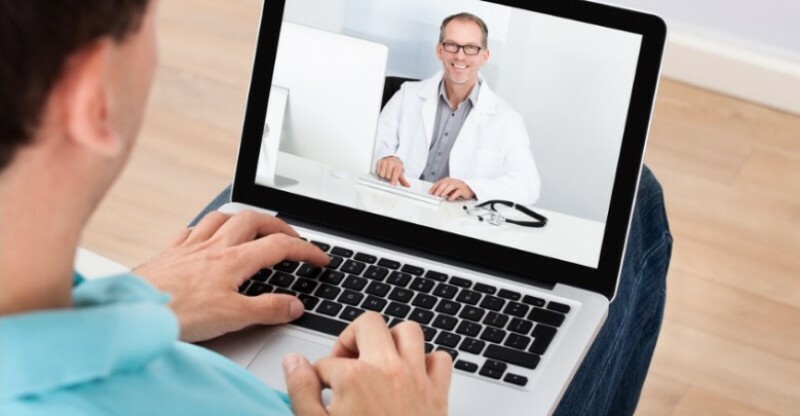 Telemedicine offers healthcare consumers the ability to connect with board-certified physicians remotely. Using a smartphone or a computer, consumers can access online doctors to evaluate, diagnose and treat patients from a distant location using telecommunication technology. As with an office visit, doctors advise on common medical conditions such as flu, headaches, insect bites, rashes, and other ailments, and can prescribe medications including prescription refills. The service is not intended for emergency situations and should not replace your primary care physician. There are several online apps and websites to choose from. Each varies in cost, as some require payment per consultation while others charge a monthly fee, but all offer quicker access to medical doctors 24/7/365. Is it cheaper than a visit to the urgent care or a regular doctor’s office? The verdict is still out. It depends on your insurance and your deductible. eVisits are covered more and more by insurance companies. However, many insurance companies still don’t cover out of office visits. In some cases, patients may be able to get reimbursed for an out of pocket eVisit at the same rate as an office visit, but again, it varies on your insurance plan. And, just as with the video streaming service you choose to view your favorite television shows and movies, not all telemedicine services are created equal – many still have a long way to go before reaching Netflix’s level of superiority. Some patients who opt for an eVisit struggle with the lack of doctor-patient relationship. The online doctor has no medical history of the patient, as there is no history on file. Patients are not able to choose the doctor evaluating them, therefore subject to random healthcare providers causing a lack of continuity. Complaints about a lapse of time before actually connecting with an available doctor are also common. Dr. Luciano’s concierge family medicine practice offers telemedicine services to healthcare consumers that is consistent, easy and reliable. There is no variation in cost, as it is a benefit included in the patient membership fee. The service provides unlimited access to Dr. Luciano, who has a detailed medical history of each patient. Dr. Luciano is available for consultation 24/7 with no patient restrictions. He can be reached as often as needed throughout the month or year. He is accessible by phone, email or text. Patients can schedule a next day office visit or Skype call for a virtual consultation. The specialized care provided by Dr. Luciano’s concierge family medicine constitutes a personal and confidential doctor-patient relationship. Unlike with mainstream telemedicine apps, patients are not subject to random doctors. They can expect Dr. Luciano to be readily available to address any medical concerns and administer exceptional healthcare upon immediate request. Dr. Luciano has an excellent reputation as being one of the Best Family Doctors in Bucks County. He is a recipient of multiple awards and recognition including “Best Physician” Courier Times for Bucks County 2011 and 2013 by The Intelligencer,” Most Compassionate Physician” 2010 – 2018, “Patient Choice Award” 2010-2018 and Best Family Medicine Physician by the Bucks Happening List for 2016 and 2017. If you would like to inquire more about Dr. Luciano’s Concierge Family Medicine services call today at (215) 515-8242 or browse our website.